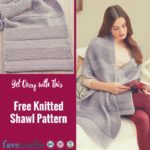 If you’re like me, you would love to have a huge green space where flowers bloom and bunnies visit hoping for a nibble to display all of your stunning garden crafts and outdoor DIY ideas. The spring and summer always makes me feel like running outside and immediately making garden projects. 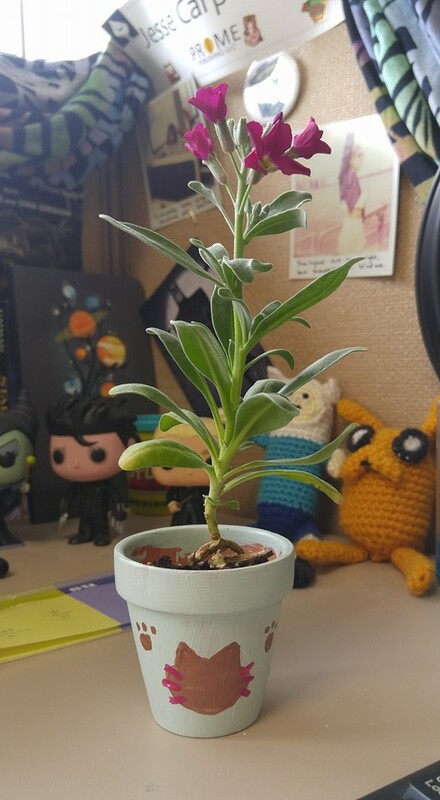 The problem is I live in an apartment and, while I may have a bright and beautiful sprawling backyard one day, right now I have a small little windowsill for my green friends. That does not stop me though! You can have a garden no matter where you live! Scale down big garden ideas and create these small space solutions. Flowers can be an option in your life, no matter how big your backyard! 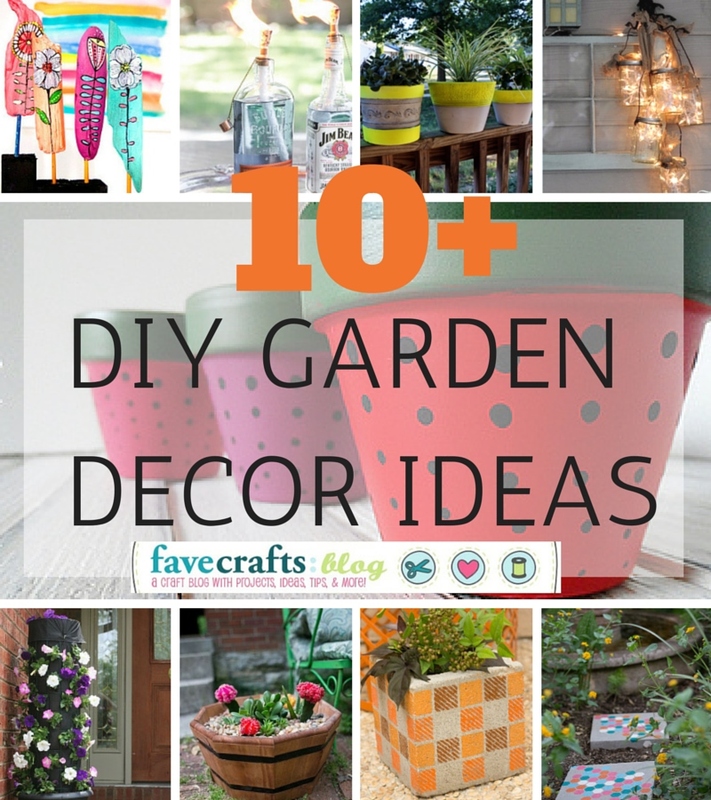 The following garden craft ideas fit in little spots. 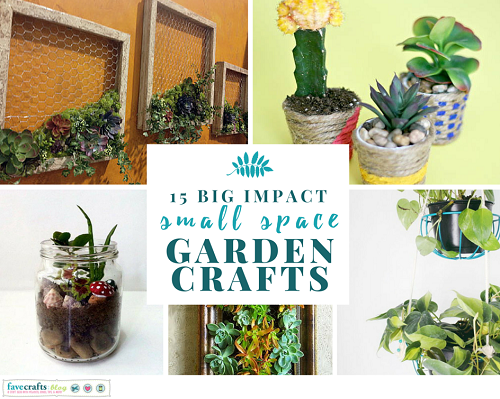 Whether you live in a small apartment, an assisted living spot, a trailer, or just have a small house with a little yard, these 15 Big-Impact Small Space Garden Crafts are for you. Super Easy Succulent Garden – succulents work in any setting! How to Paint Rocks – the faux cacti in this collection are perfect for low light homes! Frame a Vertical Garden – no room? 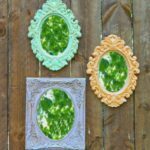 garden on your walls! Cute and Easy Miniature Garden – such a great indoor idea. Plus, How to Make a Fairy Garden! 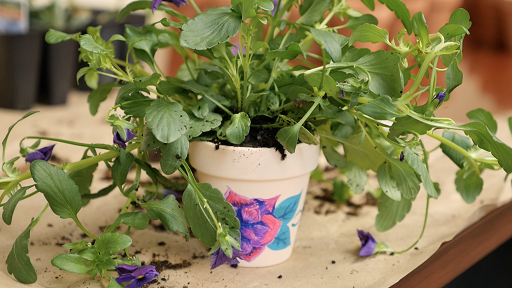 Check out our full video tutorial below on how to plan, plant, and take care of a fairy garden then head on over to FaveCrafts.com for the full tutorial, complete with even more fairy garden ideas. 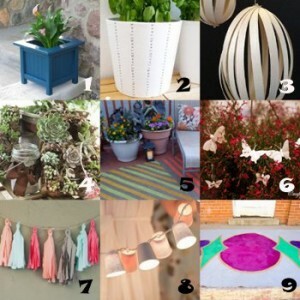 Check out our favorite garden ideas from last year in DIY Garden Decor Ideas You’ll Totally Dig. 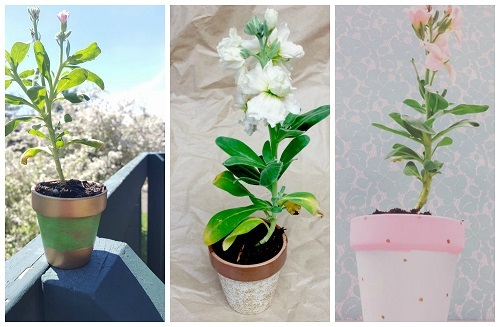 Which do you prefer: succulents, flowers, herbs, or indoor trees? 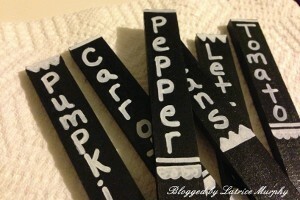 DIY Garden Hose Decor -SO cute! 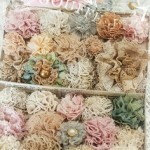 Summer Seas Driftwood Flowers – Use these as flower markers! How do you plan on decorating your garden this summer? Take a hint from the ancient Romans and decorate your home with lavish mosaic art projects. Did you know that it was common for the wealthiest citizens to have four dining rooms – one for each season? At the House of the Faun in Pompeii, each dining room is decorated in mosaics with colors and symbols reminiscent of each season. 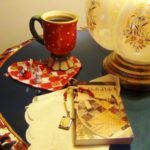 Even though such luxurious living is rare today, you can still decorate your home with that ancient art style and feel as though you are royalty. 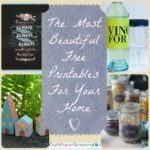 No matter where you put them, these 20 mosaic project ideas from FaveCrafts, AllFreeHolidayCrafts, and AllFreeKidsCrafts will freshen up any room in the house. Don’t be afraid to make this art form your own. Creating mosaics is easier than it looks. 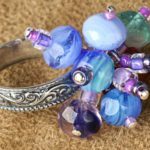 There are so many ways to can make one, and the results are always inspiring. In the spirit of the House of the Faun, these mosaic project ideas have been divided by season, but they really look lovely no matter what time of the year. 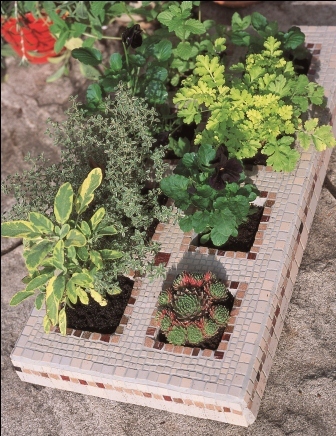 Here, you will find mosaics for the garden, kitchen, dining room, office, and more. Get ready to feel like a Roman goddess! 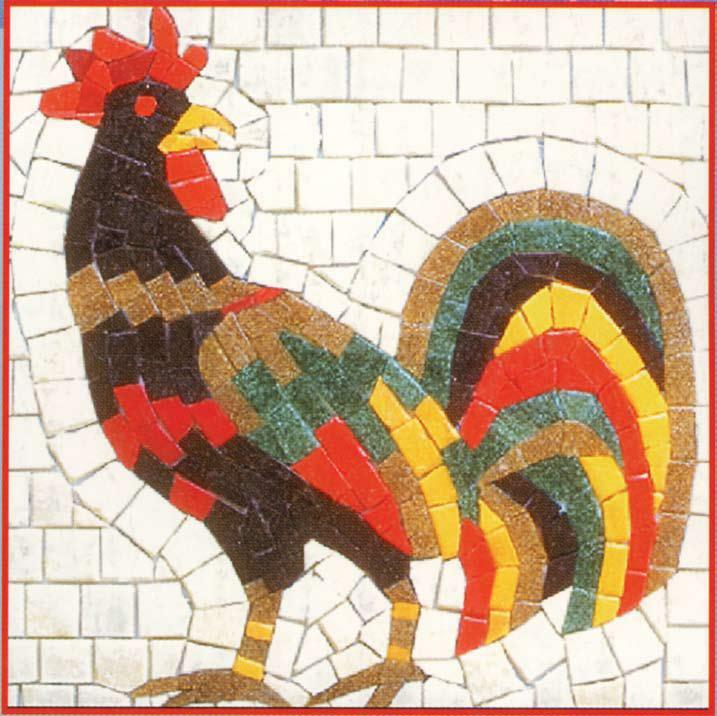 The following mosaic art projects would look great in your garden next spring. As you take a leisurely stroll through your garden, you will be surrounded by beautiful art. That’s enough to make anyone feel like an empress! 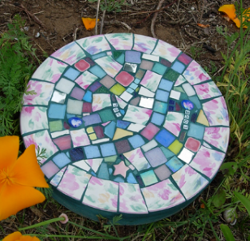 These mosaic art projects are great for outdoor décor like stepping stones. While you’re relaxing on the beach, don’t forget to pick up a few seashells for a refreshing summer craft. Enjoy bright colors and nature while you can, and craft this beautiful mosaic art. As the leaves begin to change, you will notice that nature has a flair for creating mosaics of its own. Be inspired by the warm autumn colors and show Mother Nature that you can make mosaic art of your own. These art ideas are as beautiful as the changing trees. Come, see, and conquer a few mosaic projects this fall. 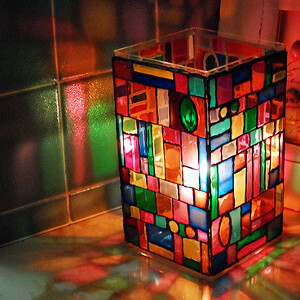 Winter is a great time to make mosaic projects as gifts for family and friends. These art ideas and mosaic frame decorating is just the gift to warm your loved ones’ hearts. 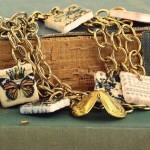 Amaze everybody on your list with handmade gifts fit for royalty. While you’re adding beautiful mosaics to your yard, you might want to spruce up your garden even more with some decorative flower pots or painted watering cans. What better way to get the latest crafting ideas than by using our free eBook Garden Crafts? 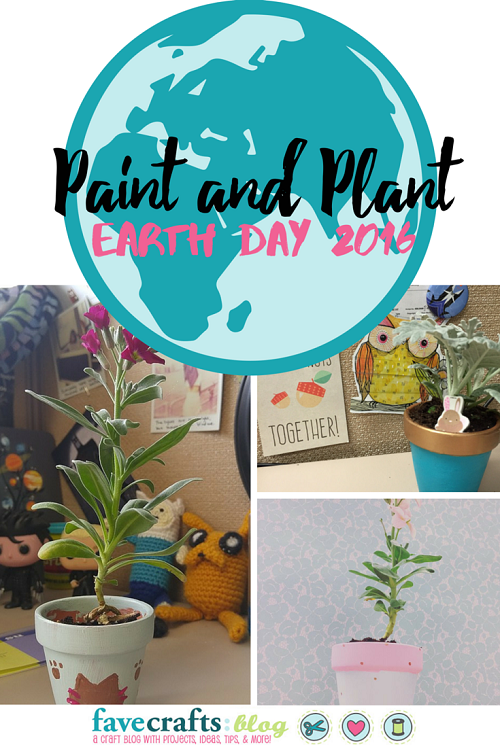 Not only are these ideas decorative and fun, but they are a great way to help the environment. Hearing singing birds in the trees is the number one sign that spring has officially arrived. Once the snow melts and the trees begin to wake from their winter slumber, birds begin to flock back to their favorite spots…but have they made your back yard one of their most frequented destinations? Make the most of springtime by gathering everyone in the family and combining your efforts to turn your outdoor living space into a bird’s dream vacation spot. 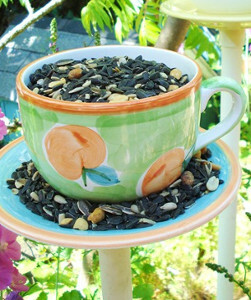 With these homemade bird feeders, you’re sure to attract all kinds of colorful birds. Making bird feeders is a truly family-oriented activity, since everyone can find a way to help out. Plus, little ones will love watching the birds come to visit! 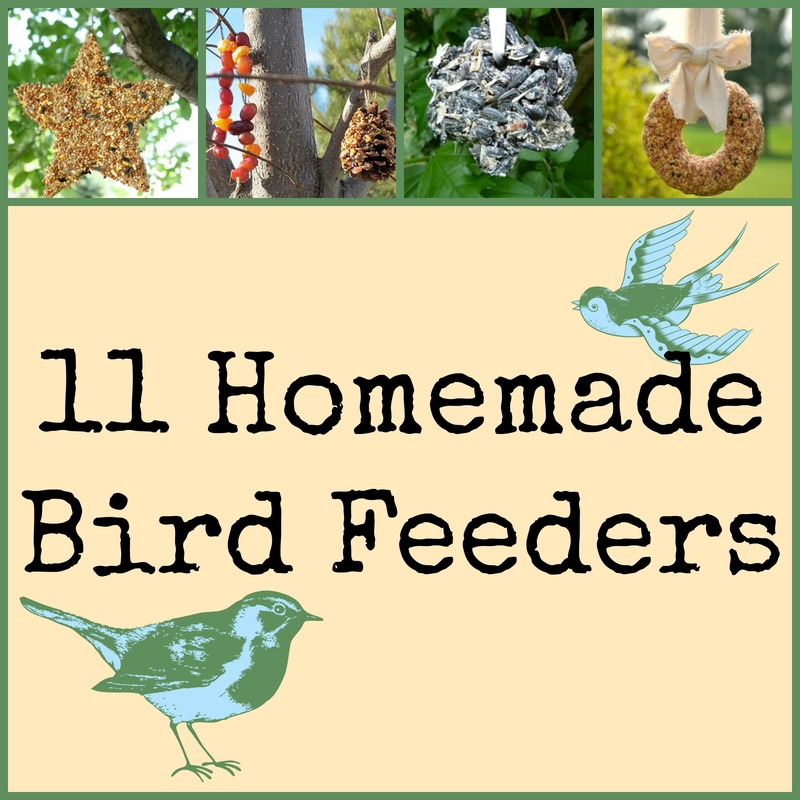 Whether you’re looking for a simple bird feeder to make or you’re ready to pull out all the stops, those of us at AllFreeKidsCrafts have gathered a DIY bird feeder to suit your needs. The birds in your back yard are sure to love their homemade treats, so don’t be surprised if you have to replenish your stock! Make these DIY bird feeders again and again to make sure your feathered friends come back all through the summer. What Should You Put in a Bird Feeder? According to the Humane Society, you can use sunflower seeds, peanuts, peanut butter, fruit, and cracked corn in your DIY bird feeders in addition to the standard bird seed you can find at home improvement stores. You can even offer nesting materials like yarn or scrap fabric to your feathered friends. Be sure to avoid using bread in your homemade bird feeders, since it has virtually no nutritional value for birds. Homemade bird feeders don’t have to be fancy to add a little charm to your back yard. 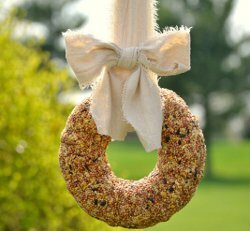 These DIY bird feeders are incredibly kid-friendly, and little ones will have a blast while they make a special treat for the visiting birds. 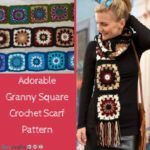 You won’t need much to make these stunners; simply choose a design, grab the kids, and get crafting! Making a DIY bird feeder for your feathered friends doesn’t have to be costly. In fact, the birds will probably appreciate your efforts to re-use and recycle! 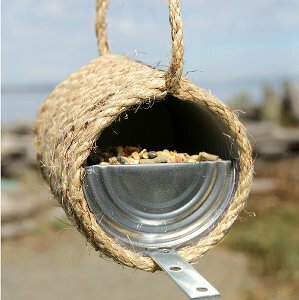 No matter which recycled material you have to spare, you can learn how to make a bird feeder the thrifty way. Finding activities to do with the kids is always a blast, especially when you get to spend some quality time outside. Discover more fun outdoor activities by checking out our recently updated list of 32 Outdoor Crafts and Activities to Do with Kids! Do you ever spot feathered friends in your backyard? Is your garden planted yet? I’m a few weeks behind on mine due to rain and cold weather here in Illinois. However, now I’ve finally got my little sprouts ready to go. This year, I want to really make my garden fun to look at and make it easy to find what I’m harvesting. The chalkboard craze has gotten to me, so I figured out how to carry its coolness into my garden this year. 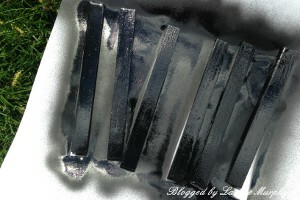 I created these Faux Chalkboard Garden Stakes in just a few steps. Best of all, it cost me only about $2 to create this project! I kept it simple with black and white and didn’t get real artsy with the writing. You definitely could use a different style pen and make these really unique. 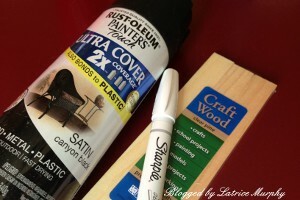 Lay out stakes on something protective and give each side two coats of paint. Make sure to let each layer dry before spraying the next. Bring them inside to dry over night. Create your writing by getting the pen started on a scratch piece of paper and doing it however you like. You can write with a pencil first for a guide if you decide to do cursive or calligraphy. That’s it! It only takes three easy steps to add some charm to your garden this year. They say that March comes in like a lion and out like a lamb, and this month has really lived up to that reputation. From sub-zero temperatures to snowy days, there have been no shortage of weather related catastrophes in my neck of the woods. Luckily, however, April means the true start of spring. I love the blooming flowers, green leaves and, of course, warmer weather. One fun way to celebrate spring is by heading outside and planting a few flowers. Better yet, if you have the space, cultivate your own garden and fill it with handmade items. There are so many ways to transform even the smallest space into a pretty garden. 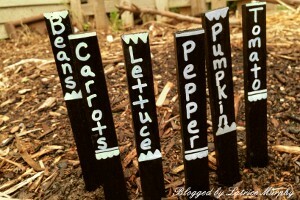 If you have a flower bed, you’ll want to create a Bead Buster Garden Stake or a Butterfly Garden Stake. 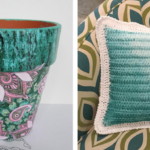 Both of these projects add a fun touch to a sea of florals. If you don’t have access to a mound of dirt, you can use decorative clay pots and planters to add color to your space. 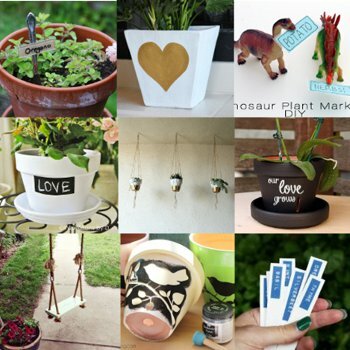 Our roundup, 10 Clay Posts You’ll Fall In Love With, features creative DIY ideas to get you started. Head out to your garden, take a deep breath and celebrate spring – you deserve it after this winter season! When the weather starts heating up there’s nowhere I’d rather be than outdoors! I love dining al fresco in the summertime–it makes me feel like a chic European without a care in the world. And of course, as a crafter, I have to do more picnic preparation than just packing a basket with sandwiches and juice boxes. 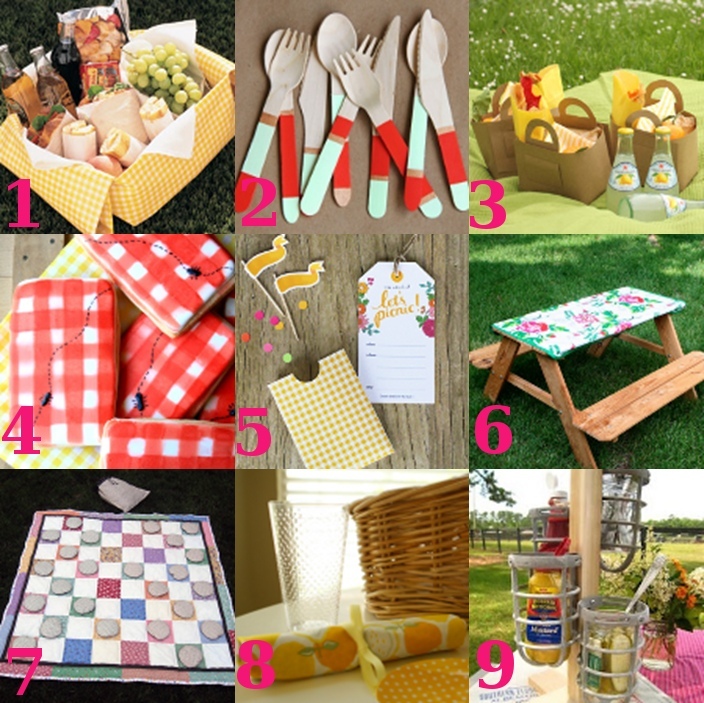 These picnic crafts are the perfect way to put your crafty stamp on a summer picnic. Picnics need not be simple affairs– there’s no shame in crafting unique cutlery holders, DIY picnic baskets, and handmade picnic blankets. Make your summer special by taking your family on a handmade picnic. There’s nothing like the great outdoors, especially this time of year. I love barbecues, campfires, and evenings spent on my porch, listening to the cicadas. 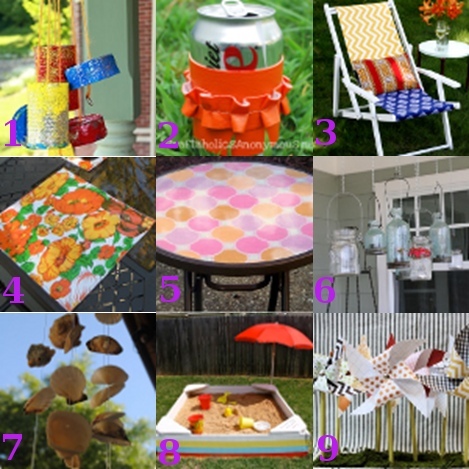 Pretty up your outdoor space with some of these whimsical ideas from around the web.